DOT Transportation, Inc. - They are based out of Mt Sterling, IL. They have a Distribution Center in CA - I think it is north of San Diego though. My trainer turned out to be a good one. He stays awake when I am driving and is somewhat patient; provides constructive feedback and is encouraging; answers my questions as best as he can, and is showing me the ropes as situations arise. I just need to remember as much as I can. I just wanted to check in and thank you for the support. Back in the first part of June I was navigating my CDL class, applying to different carriers, and figuring out the type of driving I might prefer. Well, I landed on my feet driving a refrigerated trailer , in the equivalent of a regional position with DOT Foods. I have several more weeks of training with the trainer. I am enjoying the adventure so far. I seem to be getting more questions correct now. Thank you. Here is one of the questions on the High Road CDL Program. I think the answer is zero time left. I have written out the info on a scratch sheet and still get the wrong answer. I have been attempting to get the matter understood in the High Road Training material. However, there seems to be conflicting information. The eight hour rule simply extends the 14 hours and does not add any additional time - right? I have been over the material again and again and am not able to answer the questions correctly. Any assistance would be appreciated. At this point the subject is off of the original topic, but thinking about waiting/down time with the different types of hauling (Dry Box, Refer, Flatbed, and Tanker), which type has the highest percentage on average? I like the program. I should have started it last week. How long (hours) should it reasonably take to complete all the modules in the High Road Training Program? Helpful feedback! Thank you to all. Looked at Prime, Inc and the home time option doesn't look favorable to me. There is the minimum 4 weeks out. Thoughts on the carriers noted above? Logged on today and found all your replies - THANK YOU! After reading through the information and going back over some of the articles I am leaning away from Teaming, Flatbed, and Tankers. Your points all hit home. Since I do have a wife and thirteen year old son (the two other kids are 22 and 20)at home, I need to limit my time away from home to at most two weeks. Even then I think I would need to be around more frequently than every two weeks. Probably the 7-12 options I have seen with a few carriers so I can get long runs mixed in the inevitable shorts runs. I will look into the Prime Inc option noted above. I have pre-hires with Swift, Knight, Roehl, Schneider, Werner, and US Express. They all seem reasonable places to start with. Knight, Swift, and Schneider, that I know of, have terminals with in an hour of my home (southwest Chicago suburb) so I can leave my personal vehicle there while on the road. Of the carriers noted, does one or two stand out to you as a better starting point than another? It appears to be one way to generate more income potential than a solo gig. I was considering Tanker or Flatbed work since the pay is better, but since I am totally new to driving I am reconsidering sticking to a Refer or Dry box gig. The Team idea is something I wanted to take a hard look at since the income potential is greater. I have seen a few of your writings pertaining to Team Driving and they are thought provoking. I recognize my age can influence my tolerance to another person in such close proximity. You have mentioned solo gigs and can generate income close to what I team driver can make. How is that? 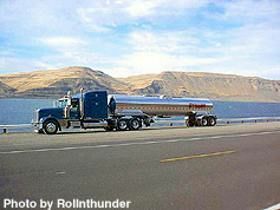 I am new to this site and trucking (changing careers) and will be taking a CDL Class with a tentative graduation date of 7.12.13. I am middle aged with a family and mortgage and a working spouse and need to pay attention to income potential. I have been trying to find a good resource regarding Team Driving and don't think I have found one yet. I have read through several forum topics on this site and still think I need more help/information. I have pre-hires from several large/training companies. However, I need to narrow down my priority list to further narrow down my choices.